John Allore has written this up, with some input from me and Doreen Prior, and suggested that we all post this in our blogs. This will allow you to data mine old newspapers back to the early 80s. There’s gold in them hills. 2. Information Management – Your local library: Most major libraries keep copies of all regional newspapers on microfiche. For Theresa’s case I was able to have the Provincial Library in Quebec mail me microfiche of old newspapers like the Montreal Star, Photo Police, Allo Police to my local library in North Carolina! I know Doreen Prior also accessed local libraries for Sharron’s case. Newspapers offer you good information about activities in the area of investigation leading up to, and immediately after any murder. I have Google Alerts set up for all key words associated with my sister’s death (names of regional towns, suspects’ names, the name of each regional police force). This is a good way to stay a step ahead of anything that may be relevant to your investigation. 4. Accessing public records: Things like medical records and autopsy reports… these are public information and readily available from your local medical examiner or coroner. 5. Makes friends with the appropriate law enforcement agency: In many circumstances a case grows cold due to perceived ineptitudes of the investigating police force. Despite the frustration you must ultimately make peace with the investigating force. Ultimately they are the only body that can bring the case to justice. Despite friction, you must work to find an understanding. This doesn’t mean you can’t continue to challenge the force, just realize that you must retain balance. Crime scene reports? Evidence? Primary information? All of this is in the hands of the investigating force. You must make amends if you hope to gain access to this information. 6. Psychics: Useful? As secondary evidence, possibly. Just realize that anything psychic / medium offers is not admissible as evidence. It can be a great resource (myself and Bill have used them), but be aware of their limitations. And don’t get strayed into kooky theories: you can see patterns in any amount of randomness. Remember that some things are a coincidence. 7. Network: Read everything. The internet is an incredible resource. Become familiar with advocacy and justice initiatives. Make friends, get educated, attend conferences. 8. Publicity: The media can be a great tool to get your story out. Remember one thing: ultimately they are exploiting you, so feel free to exploit them. “If it bleeds it leads”… and the stories the media usually are attracted to in cold cases are something gruesome or something very personal ( perhaps too personal for a crime victim… I always hated when they asked me about “closure”). Be professional, cautious and guarded. Don’t offer up anything you feel is crossing a line. You have a right to say, “no, that’s too far” with these people. Also, don’t feel bad if they don’t want to cover your story. I have spent many hours offering up angles to media (suspects, new information, a personal-interest moment, a tidbit that is relevant to a current case), if they aren’t interested, don’t take it personally. Move on. It’s a business. One of the main reasons myself, Doreen and Bill started blogs was to control the distribution of information. So you can start one too! That too is media attention! 9. Get support: Guess what? You’re only human. And very quickly you will reach a burnout threshold. Get help. Find something positive other than this cold-case that gives you energy ( a hobby, your family, a sport, your shrink). We’ve all been to the bottom. It’s no fun, but we will support you on your journey back up. One of the best things I did? Made friends with fellow victims and investigating colleagues on Facebook. At first this seemed counter-intuitive: I wanted to isolate my personal life from my cold-case life. In the end it was the right decision because it was healthy to see these people without the victim stigma, in a normal light: families, loves, interests. 10. If all else fails: Contact the Vidocq Society, http://www.vidocq.org/ a group out of the Washington area comprised of retired forensic and investigative experts dedicated to solving old cases. Slightly pretentious, but if you’ve exhausted numbers 1 – 9 at this point you have nothing to lose. A word of caution: Vidocq will only consider your case if you have support from your local police jurisdiction (so no coming here if you’ve got a beef with how the police screwed up your case). The 5th of November is a holiday that never did catch on in the USA, at least not since Colonial times. It is said that George Washington forbade the celebration of the holiday by his troops, for he saw it as anti-Catholic and pro-British. It is the 4th of July that we Americans celebrate with fireworks. Most Americans that I know have never heard of Guy Fawkes until the movie "V for Vendetta" came out in 2005, exactly 400 years after November 5, 1605. I myself have not heard of Guy Fawkes until I met a friend of Debbie's who had contributed photos to this website and blog. This person told me all about it. There's a poem that I've heard referred to as a nursery rhyme, but the actual title to it (I have learned recently) is "The Bonfire Prayer." This, I am told, is recited at the lighting of the bonfire on November 5th. Since those of us here who know it at all know only the first few lines, I present it here in it's entirety. A farthing of cheese to choke him. 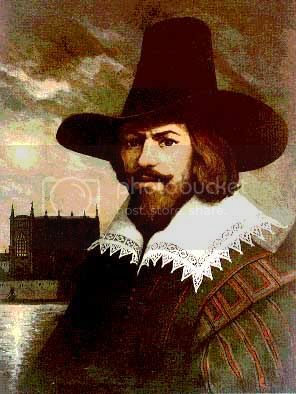 Whether you perceive Guy Fawkes as a hero or a villain may depend on whether you are a Catholic or a Protestant, or how you may feel about the political climate of Old England at the time. Whether or not you choose to celebrate Guy Fawkes Night, let us always try to remember the lessons that history has to teach us. My favorite story about what happened to Debbie Key is "Bad Dream House" by John Allore. During our Halloween weekend I have learned that John had written a sequel to the story. It is called "Beyond This Place," and the first chapter now appears in his WKT? blog. Below is a sample of the first chapter, edited by me. (...) indicates where I left out sentences. I live in a house once inhabited by a psychopath. (...) Each day there are a dozen little things reminding me that Deborah Key – the young woman who was most likely murdered by the former owner of our home – is still missing. Working in the garden, I’ll unearth some artifact belonging to the former owners. Inevitably, it will be some weapon or instrument of torture – an arrow, a spear, the broken blade from a sword. One time I found a gigantic hunting knife with brown stains on the blade. (...) Another time I found the remains of a dismembered Barbie doll. Last year my wife started a business; a children’s resale shop in downtown Carrboro. Carrboro is a little bedroom community of Chapel Hill in North Carolina. My wife’s shop is cute. She has a lot of nice stuff. (...) As fate would have it, my wife rented the space where the bar Sticks and Stones was formerly located. The same Sticks and Stones where Deborah Key was last seen alive. Every day after work I pull into the parking lot to pick up the kids. I always park in the spot where Deborah was last seen kissing Andrew Dalzell against the hood of her car. Deborah’s mother placed a small memorial on the spot with flowers and a plaque. It’s nice that it’s there to remind me. Just in case I forgot. Not long ago I got another call from our local police. Deborah Key’s body still had not been recovered. Chief Henderson wanted to return and search our property. This time they weren’t bringing a cadaver dog; they were bringing a psychic. (...) That was the thing, it wasn’t a gimmick; my friend had done it. It was amazing. She had a conversation through the medium with her dead relatives. It was creepy. There were details this medium knew about my friend’s life that only people who had “passed” could have known – little pieces of knowledge that no one could find through deception. My friend came to a conclusion. Either the medium was really a psychic and she was reading your mind; or it was for real, and she talked to the dead. My friend suggested I arrange for a consultation with my sister. The medium charged two hundred dollars an hour. I said I’d think about it. On the weekend I phone my parents and ask them about the medium. They say, why not? I talk with my brother. He can’t think of a reason not to do it either. Curious. I was hoping one of them would stop me. At Barnes & Noble I “inadvertently” wind up in front of the New Age section. My medium’s staring at me from the cover of her book. What’s going on here? Today is the day the trial begins for Curtis Lavelle Vance, who last year murdered TV news anchor Anne Pressly in Little Rock, Arkansas. I plan to keep up with this case. Here is some more news on the prison release issue. Tomorrow will be the 31-year anniversary of the murder of Theresa Allore - November 3, 1978. Also on this day, 3 years ago, Michelle Young was killed near Raleigh, NC - November 3, 2006.